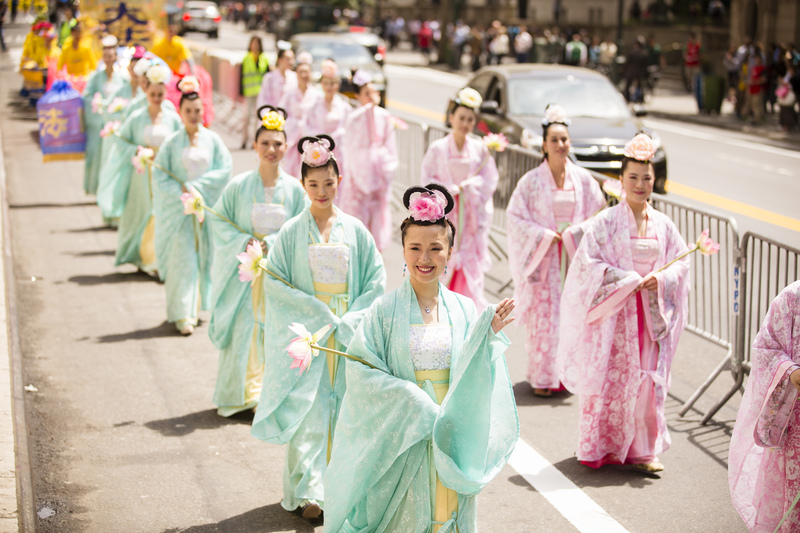 NEW YORK—Walking down 42nd Street from the United Nations on the east side to the Chinese Consulate on the west side a colorful parade of some 8,000 Falun Gong practitioners delivered to midtown Manhattan on Friday afternoon a message of peace and human rights. At the same time, the parade delivered a serious message about the persecution of Falun Gong in China, a message that Marilyn Aspen, an entrepreneur in the city, was moved deeply by. 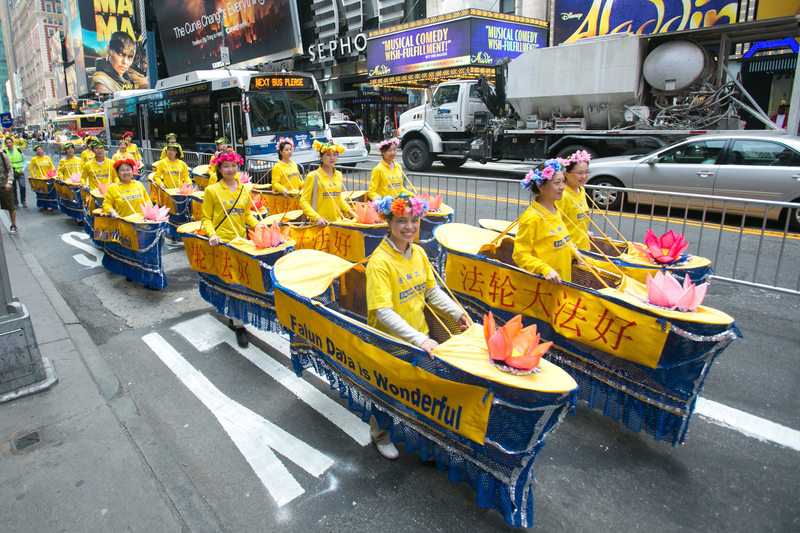 The parade was the climax of a series of events beginning May 12 that were staged in New York by Falun Gong practitioners to honor World Falun Dafa Day. On May 13, 23 years ago in northeastern China the spiritual practice of Falun Gong, also called Falun Dafa, was first introduced to the public. Since 2000, practitioners have celebrated the date as World Falun Dafa Day. According to Yi Rong, one of the parade’s organizers, around 8,000 people took part in the parade. It led off with a section about Falun Dafa itself, followed by a section devoted to the persecution of the practice in China, and then a third section about the movement to quit the Chinese Communist Party. Falun Dafa involves self-improvement through living according to moral teachings and doing slow-moving, meditative exercises. In the “Falun Dafa Hao” section (“hao” means good in Chinese) large books representing “Zhuan Falun”, the main Falun Dafa text, were wheeled up the street. 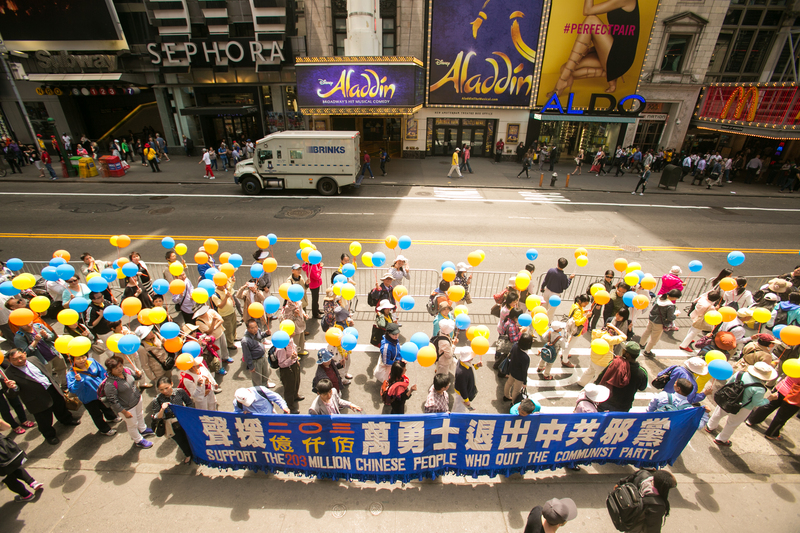 There were floats with people doing the Falun Dafa exercises, and banners inscribed with truth, compassion, and tolerance, the main principles of the practice. The parade gives you good a message for peace. Since it was first introduced to the public, Falun Dafa has spread around the world, a fact evidenced by the large banners in Russian, Chinese, English, French, Spanish and other languages that Falun Dafa adherents carried in the parade. Strangely, China is one of the only places where Falun Dafa is not freely practiced today, a result of a violent campaign by the former Communist Party leader Jiang Zemin, who became jealous of the group’s popularity and vowed to have the practice eradicated in 1999. 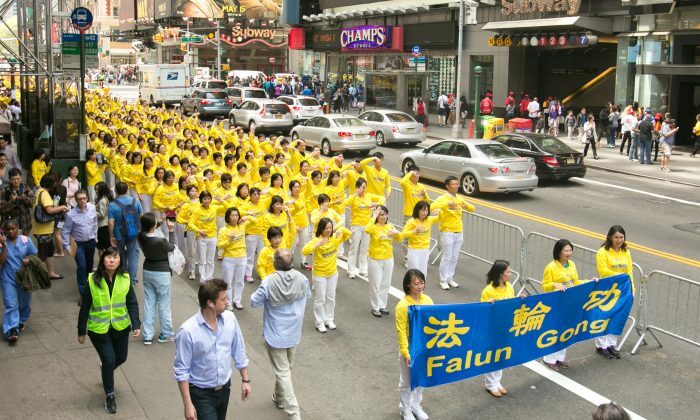 “We can celebrate the World Falun Dafa Day, but the practitioners in China who are still being persecuted for their beliefs, compared to them, I feel very lucky,” said Pei Yu, a Falun Gong practitioner who is originally from Mainland China but now lives in Brooklyn and marched in Friday’s parade. I know that they have to be very, very frustrated. 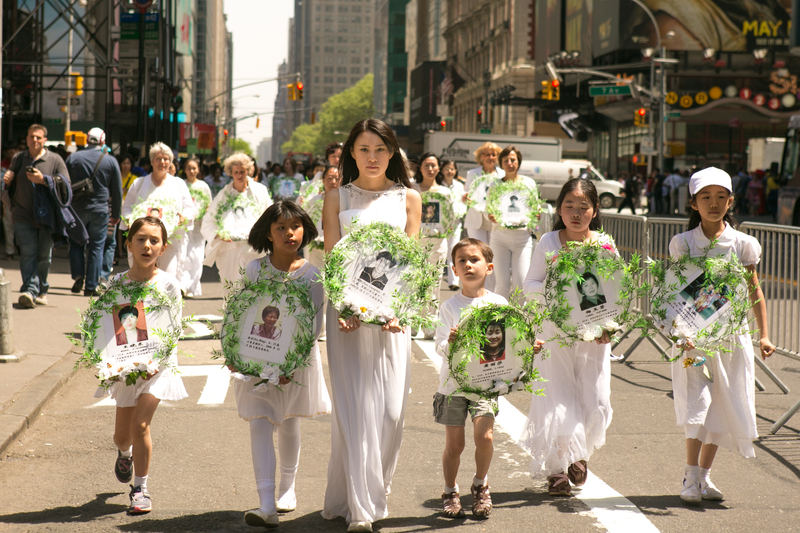 One section of the parade was dedicated to bringing awareness to the persecution in China, something organizer Yi Rong said is still lacking in the United States. Janet Estrella, who was watching the parade on her way to work, said it was “encouraging” to see the parade raise awareness of the situation in China. 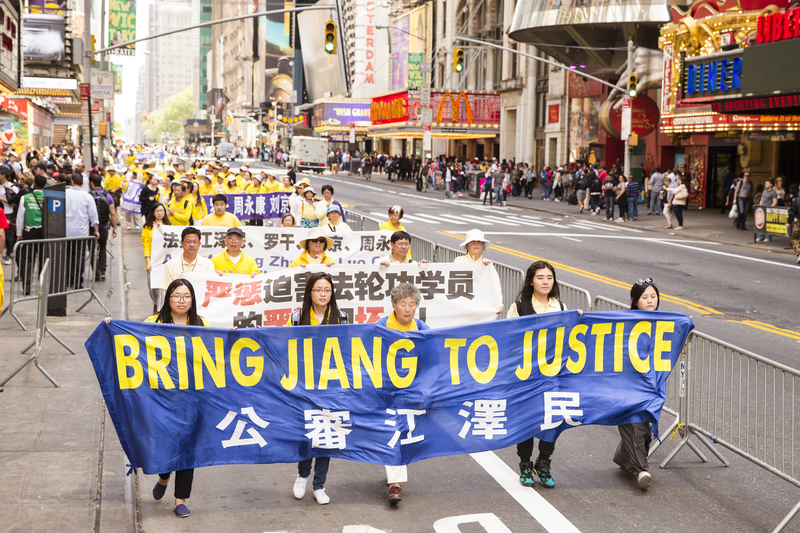 Falun Gong practitioners have supported a movement in China called “tuidang,” which means “quit the Party.” Before the parade, the Tuidang Center held a rally outside the U.N., and the third section of the parade featured banners and poster boards heralding the Chinese people’s leaving the Chinese Communist Party and calling attention to the Party’s crimes. When they tuidang, Chinese submit a statement to the Tuidang Center renouncing their memberships in the Chinese Communist Party (CCP) and its related organizations. This has the effect of “clearing their conscience of years of Party culture indoctrinated in them through revolutionary campaigns, propaganda, media censorship, imprisonment, and mass killings over the past 65 years,” the English Tuidang.org website says. Falun Dafa Day was celebrated in Montreal on May 9th. It was a very hot day, unusual at this time of the year.